João, 53, works in the cinema and advertising industry as a technician in charge of generators. He is the man who ensures that the lights are on at all times. Have you ever witnessed a complete studio shutdown? There’s a whooom sound, and bang!– the Universe collapses into a particle again. That’s what João does: he prevents localized reversals of the Big Bang. Or used to prevent, because the crisis and the austerity left him out of work. When the tide allows, João goes clam-digging at the river banks. 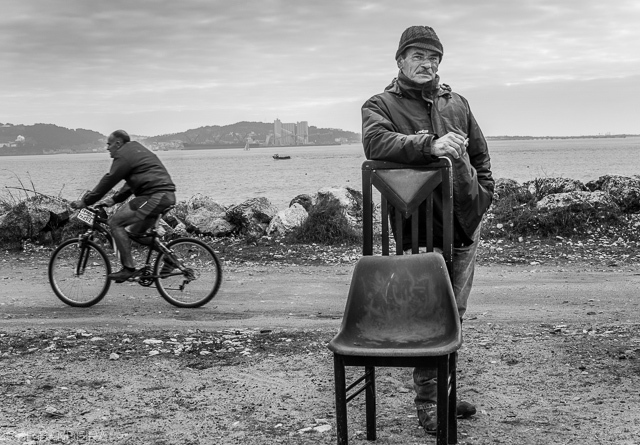 I’ve arranged with him to go along one day – ‘All you need,’ he says, ‘is a pair of wellingtons.’ Like many of his neighbors of Dafundo, João passes some of his time on the strip of land where the railway line connecting Lisbon and Cascais was built. He feeds the pigeons, cultivates vegetables, watch the joggers and cyclists go by and, generally speaking, has a good time playing cards and drinking red wine. Tables and chairs manage to survive between boats, piles of empty bottles and junk of all kinds. Zé, another local, had shown me before the chair you see in the picture. I point it to João. He immediately claims the authorship of the piece: he made it from two ‘objets trouvés’. I take a shot of him with his artwork. Oblivious to the significance of the moment, cyclists and joggers insist on passing by.